Candy store chain Choc Spot has 11 locations in Singapore, including one shop at the Century Square mall (2 Tampines Central 5). 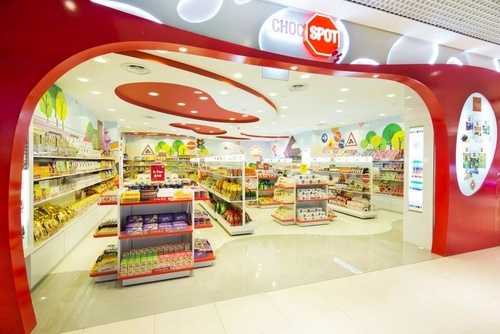 Choc Spot is an exciting candy shop concept that can be found especially on the sub-urban malls in Singapore. The international candy brands include Ritter Sport, Fazer, Lorenz, Jelly Belly, Cadbury, Kägi, Gavottes, Hawaiian Host, Swiss Delice, Droste, Frey, The Belgian, Toblerone, Ferrero, Hershey’s, M&M’s and many more. In addition to chocolate, you can also purchase snacks, cookies, and various types of delicious candies, all perfect as gifts or used for personal indulgence. Some of the best offers for candies and chocolates are sold as Special Bundles and as Daily Deals. Choc Spot’s official Facebook page is located at www.facebook.com/ChocSpotSG. The Facebook page is one of the best places to learn about the latest promotions and sales at the stores, as well as about new, imported candies.